At 11:56am BBT, the live feeds went to trivia after Aaryn came out of the Diary Room announcing that it was time to pick players for the Veto Competiton! They'll also find out who the 3rd Nom via MVP votes this week is. They said they have the numbers to keep Amanda safe & if Howard wins veto, then Spencer will go home this week. Andy: "If if you don't win veto, it doesn't f**king matter!" They think Howard is MVP and put Amanda up. McCrae is pumping Amanda up to win veto & pull herself off. McCrae: "If it's a buzzer, hit it fast! Whatever you have to do, if you have to shave your head, shave your head! If you have to dye your hair, do it! You just gotta f**king kill!" Helen/Andy/McCrae/Amanda are now in the Storage Room. Amanda is freaking out but knows that they have the votes to keep her in the house. Helen: "You have the votes, you have nothing to worry about." Amanda: "F**k!..kinda expected it. It's almost like anxiety." McCrae: "I think you can win it for sure." Helen is prepping Amanda for whatever the comp could be. McCrae: "It doesn't matter what (the comp) is gonna be, you just gotta f**king crush it!" Judd starts going off about how Howard is using the sympathy card and getting all the girls emotional to try to save him. Judd: "I'm not a p***y like (Howard) is. I think you (Andy), me and McCrae should get in Howard & Spencer's face and be like 'F**k y'all, you're going home!" Jessie starts laughing & begs him to not do that. Amanda & Aaryn join the HOH crew. Amanda: "If you win the veto Jessie, you gonna take me off?" Amanda: "If it's a luxury comp, you gonna take any prizes?" Amanda: "Well that wasn't a good answer." Judd: "At least she's not lying." Aaryn thinks Howard's the MVP. Amanda: "Of course Candice gets picked to f**king play." McCrae is telling Spencer to win the veto. He mentions he thinks Howard is the MVP. Spencer said Howard would've told him (S) if he was, so it's not him. Aaryn warns Amanda that Elissa/Helen seem to want Howard to stay, but Amanda says there's "no way" that Helen would keep Howard over her..she has her vote for sure. They speculate what kind of POV Comp it could be. Talk turns to what to do if Candice wins veto & takes Howard off. Sounds like Elissa might go up as the replacement nom, depsite Aaryn saying she'd rather not because they (Elissa/Aaryn) are mending fences right now but if she had to, she would. Amanda is pacing nervously back & forth. Amanda is in total panic mode & is telling Aaryn & Jessie to drop out of the comp at certain times so she can win veto. Amanda: "1 of us 3 have to win." McCrae tells Judd to calm down & that Helen is truly on their side. Helen/Elissa talked. Helen said that they need to protect Amanda this week because she's been loyal to them. Elissa agreed. Helen is telling Amanda that they are all keeping her safe this week and to not worry. 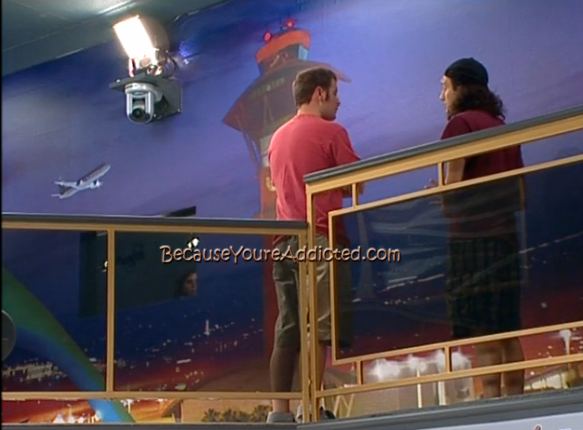 Judd is talking to Howard/Candice. Howard is telling he's not the MVP, despite what Judd thinks. Judd believes him. Andy wonders who Aaryn would put up if Howard or Spencer come off the block. Amanda thinks she'll put up GM. They're talking about if there's a "special power" that someone in the house got, like a Coup d'etat. Jessie wonders why Howard goes into the Diary Room "all the time". Andy said because he's formed alliances with everybody. Amanda: "As long as 1 of them (H/S) stay up there, then it's fine!" I hope Candice wins, pulls Howard off and then Amanda can go home. I know I am most likely dreaming but I too would like to see the other side of the house have to worry. I am not a big fan of Howard but it would shake things up. Wait Helen, didn't you tell everyone to keep Kaitlin safe because she was so loyal, just days before she went home? Love that Amanda is up. And she is proving her real strength is running her mouth. Now that she is being tested she is falling apart. I hope Amanda crushes it and puts Candice up as replacement. Howard basically told everybody that because of his witness he is a better person than all of them. I didn't see McCrae jumping to Elissa's rescue during the veto comp last week. Pretty sure he took the $5,000 prize. Hopefully these house guests realize that Amanda needs to go. Get a big player out while she is up there. Hoping Howard or Candice win veto just to shake things up. They need to get Amanda out while they can. I didn't see McCrae jumping to Elisa's rescue last week during the veto comp. Instead he took the $5,000 prize. These house guests need to wake up and realize that this is a golden opportunity to get Amanda out. Do you really think she'll have the numbers to stay? Jamie, who do you want to win veto? Who are you rooting for at this point? Hmmm...not sure, to be honest. I have a different scenarios that would be good for various reasons. I've always liked Howard and I like Candice. I just think a majority of this cast is super lame and bring nothing to the show. But Amanda is by far the most annoying to me. Shes really bossy and tries to strong arm everyone...and for some reason they all generally do what she wants. Sick of it. Hopefully the they realize this is the perfect time to remove Amanda from the game...plus it keeps all their hands clean! Pretty happy to see Amanda go up. While she is funny at times, she mostly reminds me of a high school bully. What bothers me about this season is that its basically been house majority rules so far. I know its early but we need someone to stand up and make a splash!! I was thinking the same thing. I like Amanda but want more drama. This season has been somewhat dull. THank you so much Tina!! :D I'm just curious, what site was that where you saw someone being that rude? (I wont post the comment, I'll delete..just curious.) That's horrible, though. If Amanda pulls herself off, then the replacement nom will be made at the Veto Ceremony on Monday. Since AManda is America's choice, it'd be whomever was the 2nd most voted for to go up (probably Elissa) to take her seat. I don't dislike amanda at all, however I did cast my vote for her. I think she is so strong mentally, and is clearly running the house. No one is going after her which they should. I think her fault is she is playing a little too strong. Amanda is pretty much the one person who stood up to the Mean Girls a few weeks back when they were running rampant, and that earns her America's scorn? I've had a huge amount of respect for her since then, which has only grown since seeing the way she's been playing. She's had a lot of influence over people without getting her own hands dirty, and usually we call that good gameplay and reward players for it... don't we? I'm pretty sure she only got the nomination because Aaryn was ineligible, but even so, it makes no sense. People are complaining that it's been a dull season, but they want to see the one person who's been playing a strong game sent packing. It seems silly to me. I'm thinking this POV will happen to be a bench press contest. LOL Not sure what kind of comp Candice would do well in. Like Kaitlin observed in her Live Chat with Jeff, instead of rooting out floaters, the MVP is being used to backdoor the strongest players.Before you know it we'll be left at the end with live feeds with Howard mumbling to himself, and GM and Jessie doing each other's nails, and talking about Nick, 24/7. I do too. Why are so many people upset with Amanda? Ya, she can be pushy...but she is so funny and has a lot of entertainment value. So her and McCrae "sloth" around the house. But I like them. There are so many people I'd like to see leave before Amanda. She's got to make it to jury at least. It wasn't a matter of taking it and stop playing in the comp. He continued playing. And whatever punishments or prizes they ended up with, they were stuck with and didn't have a choice. He still tried to win. Jamie, I'm in the same boat as Tina. It's hard enough to keep up with BBAD. So I really appreciate all that you do. This is where I get my BB fix. So keep up the good work. Thanks! Agreed...I hope that Amanda wins veto, and that the next mvp nom is Elissa. Curious why do you people hate Amanda? I M with you both about Amanda...Don't hate the player who is playing the game...to those Amanda Haters! REMEMBER THIS IS A GAME! I don't think it's people hate Amanda, I think well at least for me she's to comfortable, she thinks she can't be touched. none of them would have put her up and I think she needed a reality check, so putting her up as MVP makes since to me. She's not going home anyways unless someone in there uses their brain and realizes she's a threat and makes a move. I don't understand why America chose to put Amanda up. She's not playing a perfect game by any means, but she's at least playing. She will continue to shake things up as the game goes on, and I'm not so sure that some of the other houseguests will do so. She's entertaining, a decent player, and she has the audacity to shake up the house. I feel like GinaMarie or Elissa should have gone up. Elissa showed us in the last week that she has poor character AND boring gameplay. GinaMarie continues to entertain at her expense, but she's just aimlessly floating. It was incredibly smart to get Nick, Jeremy, and Kaitlin out, but if strong players continue to leave, the game is going to be more dull. Furthermore, choosing to nominate Elissa this week would have been a great move since she can't play in the veto competition. I'm hoping that Amanda pulls herself off and Elissa has high enough votes so she can go up and out. Lol. Remember it is a Game!!!! Amanda runs the house and maybe if she was evicted The rest of the Houseguests Would Play Their Own Game!!!! Remember It Is A Game!!! And if Amanda Goes Home The Houseguest Would Make Their Own Choices. From what I See Amanda should have more Respect for Herself. She will be remembered for giving BJ's and HJ's on Live TV. I love Amanda, she brings fun and humor to the house which it seriously needs!! While falling in love!! Amanda there lots of people who love you!!!! Amanda and Mcrae all the way!!!! !